Combining comfort, style and sophistication, linen pants evoke classic summer fun in the sun. Whether for attending a seaside wedding, enjoying an afternoon date or just lounging in style, the summer will definitely be enhanced with these pants in the wardrobe. Why Wear Linen Beach Pants? 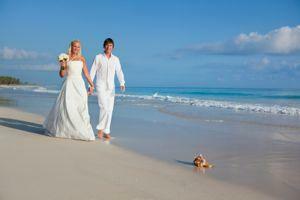 By far the most common reason for wearing men's linen pants at the beach is for a wedding by the shore. Whether you are the groom, best man or just an attendee, this is the ideal way to be both wedding- and beach-appropriate. Linen, especially organic linen, is one of the most comfortable fabrics you can wear in summer. It is light, cool and has natural properties that wick away moisture. While the texture itself can be coarse or soft, depending upon the make, the experience of wearing linen is always pleasant. Linen is also unique in that it is both naturally elegant and casual. For decades, when men were still expected to wear suits all year round, their summer suits were often made of linen. Organic linen, although more expensive, is a fine investment in that it holds up well over the years and is naturally stain-resistant. While its capacity to wrinkle is well known, a quick application of a hot iron will keep the garment looking fresh. The naturally loose fit of men's linen pants, especially those made for the beach, makes it easy to shop for them online. So long as you have accurate waist, hip and length measurements, you can usually guarantee a good fit. If you are shopping for a wedding, you might start with Wedding Tropics, a shop dedicated to providing a range of clothes appropriate for an exotic wedding. They carry linen pants in both formal and more casual drawstring styles. All the pants can be customized, should you desire, but be sure to allow up to six weeks for your order. The formal ready-made pants currently available are called the Verona. They are a relaxed fit pant in a linen-rayon blend with a zip fly and hidden button closure. They have side-seam front pockets and two welted back pockets, and are available in coffee, cream, khaki and dark khaki. Amalfi. A formal zip-fly, button-closure pant. Made of 100% linen, they have a 36" inseam and come with unfinished hems. They are available in white, ivory, natural, chocolate and black. Riviera. A casual drawstring pant with side and back slit pockets and cuff detail. Madrid. A slim-fitting, European-cut trouser with a zip fly, button closure, back flap pockets and twill weave. At My Cuban Store, you can get men's pants in 100% linen. These pants retain a casual look with their drawstring closure. They are fully lined and have two pockets. Tommy Bahama makes a pair of pants suitable for the beach or lounging in 100% linen. They are available in five colors, including white or natural, and they have an elastic waistband as well as belt loops. They're available in sizes small through triple extra large. Most of the linen pants available recommend dry-cleaning. This is certainly necessary for blends. A garment of 100% linen can be hand-washed or washed in the machine on a gentle cold cycle. With pure linen, the more it is washed, the softer it becomes, which prevents it from wrinkling as badly. No matter what, linen must dry either by hanging or lying flat. The best way to iron linen is by using a high setting while the pants are still damp and inside-out. Iron until they are smooth, not dry, and then hang them up to finish the job.